Die Goldwatzel (also spelled Goldwarzel) is an old herb that was cherished in Native American and earlier Deitsch traditions but has fallen by the wayside over the years. The plant is known in English as Goldthread or Canker Plant, and the taxonomic name are Coptis groenlandica and the synonymous Coptis trifolia. This little plant is common throughout the wooded areas of the Deitscherei, particularly in places with damp soil. The part used is the rhizome, which is traditionally dug up in the autumn. The rhizome is traditionally used in a decoction applied as a mouthwash or in a gargle or lip lotion. As was the case with the Lenape, the early Deitsch used Goldwatzel as a wash for sore mouths, and the Deitsch also used it as a tonic to restore strength and appetite after suffering from a fever (Brendle, Thomas R. and Claude W. Unger. Folk medicine of the pennsylvania germans: the non-occult cures. Norristown, PA: Pennsylvania German Society, 1935, p. 121). 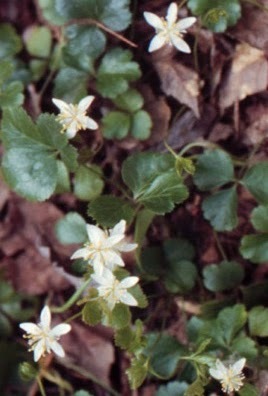 As one of the English names for the plant shows, it has been used for the treatment of canker sores (pdc: Maulgschwier). Disclaimer: This information is for educational and discussion purposes only. Nothing in these posts is intended to constitute, or should be considered, medical advice or to serve as a substitute for the advice of a physician or other qualified health care provider. Goldthread (Coptis groenlandica or Coptis trifolia) should be used only under the supervision of a physician and should not be taken or used during pregnancy. These uses mirror modern uses, which also include the plant being used as a treatment for peptic ulcers (Bauchgschwier) and vaginal yeast infections (der Deschbils). The plant's active constituents include, among others, the isoquiniline alkaloids berberine and coptisine. Goldthread has been used as a substitute for the unrelated Goldenseal (which shares one Deitsch name (Goldwarzel) but is also known as es Goldsiggel; taxonomic: Hydrastis canadensis). See also Chevallier, Andrew. Encyclopedia of herbal medicine, pp. 194-195. New York: Dorling and Kindersley, 2000. The herb is said to be a highly bitter tonic, which, as a decoction imbibed as a tea, would aid with stomach problems. One use for the herb that seems to be uniquely Deitsch is as a treatment for alcoholism (Deitsch: Aelkehaalsucht). The consumption of the bitter decocted tea is said to reduce or remove the craving or alcoholic beverages (Wieand, Paul R., Folk medicine plants used in the penna. dutch country, p. 23. Mechanicsburg, PA: Rosemary House, 1992.). It is this last aspect that presents an interesting interaction from the Blanzeschwetze perspective. This plant is said spiritually to have an advisory spirit that can help direct those with addiction issues towards resolutions. However, the plant spirit will not communicate with those who would deny or not confront the reality of an addiction issue. This refusal to communicate with those who deny addiction is, in my opinion, a link between the "sore mouth" aspect of the plant's healing nature. If the sufferer is unwilling to speak truth from a "sore mouth," then the plant spirit will convey no advice. This bit of lore from Blanzeschwetze leads to a new link in Urglaawe between the plant and the goddess Vor, who is known from Norse sources to have a wisdom that allows for nothing to be concealed from Her. Disclaimer Again: This information is for educational and discussion purposes only. Nothing in these posts is intended to constitute, or should be considered, medical advice or to serve as a substitute for the advice of a physician or other qualified health care provider. Goldthread (Coptis groenlandica or Coptis trifolia) should be used only under the supervision of a physician and should not be taken or used during pregnancy.